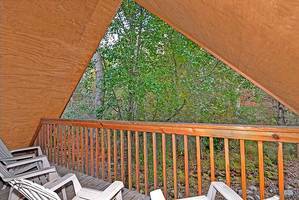 Gatlinburg Cabin Rentals, Secluded Cedar Creekside Cabin. 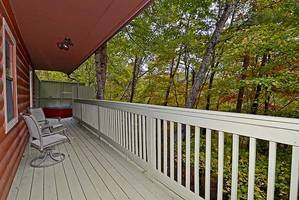 If you are looking to be secluded in a park-like wooded setting, tucked away from downtown Gatlinburg, and off the beaten path, the Creekside Cabins are a perfect match! Thank you so much for having us. We have definitely enjoyed our stay. Thank you for making my birthday and anniversary great. We visited the LazerPort Fun Center and rode all the rides we could. The Ferris Wheel was our favorite. Honeymoon Hills was great and everyone I spoke with was nice. We enjoyed being here and will be back. The cabin was awesome and very relaxing! We enjoyed hiking Mt. LeConte. The Park Grill Steakhouse was our favorite restaurant. We had a great time. Thank you so much! We are here on our honeymoon. 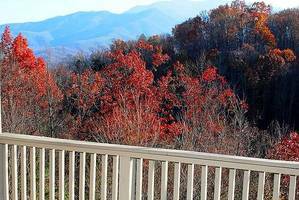 We have traveled through Gatlinburg and surrounding areas. We are sad that we have to leave. Honeymoon Hills is awesome and we will definitely be back! This trip was for our honeymoon. We drove up into the mountains, ate at the Cracker Barrel and Three Jimmy's. This was the best idea for a honeymoon ever! The cabin was perfect and we enjoyed it so much. 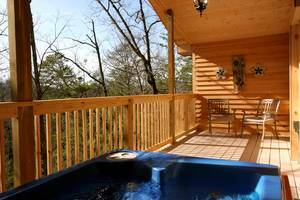 After a day in town enjoying shops and attractions we came back to a cozy cabin and relaxed in the hot tub. We laughed and talked for and hour or two, slept in our huge bed and woke refreshed. We found some cards in our cabin for discounts to a few local attractions. One was for the Dixie Stampede Dinner Show. I called and made reservations for the next evening. I would like to thank Honeymoon Hills for the discount card. We made a lot of wonderful memories here that we will never forget. We are already talking about coming back and staying longer. We celebrated our honeymoon at Honeymoon Hills. 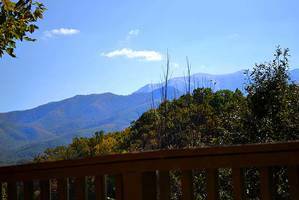 Our favorite attractions were Cades Cove and renting a jeep and riding up in the mountains. Our favorite places to eat were Paula Deen's and The Peddler Steakhouse. Thank you for the wonderful experience. We will definitely be back. We had a lovely time and our cabin was perfect! We thought Cades Cove was gorgeous. We loved it. Your wedding shouldn't be a time full of stress and the folks at Honeymoon Hills take care of everything for you. From the retro, rustic, romantic cabins with great mountain views to anything you need the friendly staff has you covered. Definitely will return! We arrived the first night and headed into downtown Gatlinburg. We went to the Smokey Mountain Moonshine Distillery. The tickets that Honeymoon Hills offered helped us choose to go to Ripley's Aquarium. Well worth it with the free ticket. We also went to Ripley's oddities museum and Ripley's haunted house. We loved it! We got married on December 26. We loved our cabin. Its so romantic. The hot tub was great. We visited Titanic, Bass Pro Shop, Bubba Gump Shrimp Co. and Paula Deen's Family Kitchen. It was a lovely stay and will be back for sure! This trip was a complete surprise to me. My husband planned this trip a year ago to celebrate our 15th year anniversary. He had also planned a wedding vow renewal ceremony and invited my family as well. I finally got my dream of having my dad walk me down the aisle since he wasn't able to attend our first wedding. The ceremony was one of the happiest moments of my life. We rented our dress and tuxedo from a shop on the main strip in Gatlinburg. They were very helpful and I was able to pick out my perfect gown. The minister was amazing! He walked us through every step and made sure we were comfortable. The photographer was amazing as well. Our special day will be frozen in time with every photo. Our cabin was the most romantic places I had ever been. This weekend was the most amazing, romantic and special time of my life. I felt like a princess. We had a lovely time staying in our cabin. It was very cozy and romantic. We loved seeing Dollywood at Christmas time! Gatlinburg was full of Christmas spirit this time of year. We will definitely be back. This was our first time at Honeymoon Hills and we loved it. We had a wonderful time visiting Gatlinburg and Pigeon Forge. We come once a month to visit both towns and enjoy the shopping, shows and night life. We will be returning soon. We enjoyed the Comedy Barn the most. Thanks Honeymoon Hills for the free ticket! We came to Gatlinburg to celebrate our honeymoon. We absolutely loved our cabin. Its view was incredible. We like that we were close to Gatlinburg but away from the noise. We loved talking to the locals. The thing we enjoyed the most was the shops and cafes in the arts and crafts community. Our cabin was wonderful. We loved it! Our cabin was beautiful and better than we imagined! 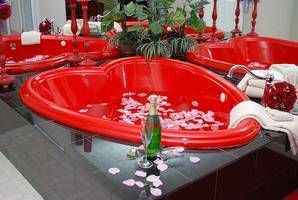 It was clean, cozy, welcoming and very romantic. The setup was amazing and the views of the mountains were gorgeous! We enjoyed exploring downtown Gatlinburg, Ripley's Aquarium and the Pigeon Forge Gem Mine. Thank you for such and amazing experience. Our cabin was absolutely beautiful. It was spotless and smelled wonderful. The country music playing on the television when we walked in was perfect! I could live in this cabin. We were here on our honeymoon. It was very quiet, secluded and just what we needed. The Dixie Stampede show was wonderful and Harpoon Harry's Crab House had really good crab legs. This cabin, was better than any dreams I could have had for our honeymoon. All the attractions were mind blowing. We visited Ripley's Aquarium and the Titanic. Sincerely, we had the best cabin ever! We did not go out of the cabin during the two days we were here. This is certainly not our last visit. We had a great time! We loved our cabin and hated to leave! Everyone we spoke with at Honeymoon Hills was polite, kind, fantastic and helpful. Our restaurant recommendation is The Alamo. This was a perfect way to celebrate our 30 year wedding anniversary. We will definitely be back. We had a wonderful time staying in our cabin. Everything was perfect. We loved the pool table and enjoyed our visit. We hope to return again. Thanks for everything. My husband and I were here on our honeymoon and we had a great time. We visited downtown Gatlinburg and Pigeon Forge. Some of the attractions we went to were Ripley's Aquarium and Guinness World Records Museum. Alamo Steakhouse is the best steakhouse I have ever been to. I highly recommend it! We hope to return to Honeymoon Hills in the future. Thank you for a great visit and you hospitality. Honeymoon Hills takes the cake in terms of places to stay. My wife and I were married the weekend before and we couldn't be more grateful for the calm, serene atmosphere. We were close to all the fun and attractions but at the end of the day we get to enjoy each other. This was our first time to visit the Smokey Mountains. Our first impression before we came was that we would see high mountains with some places to visit. When we got here we were surprised. We went to the peak of the Smokey Mountains, waterfalls and downtown. We didn't have enough time to visit everything there is to do. We will definitely be back to visit attractions we missed. Our cabin was awesome. Everything was wonderful with our stay at Honeymoon Hills. We stayed to celebrate our 18th anniversary. We had never gone on a honeymoon so we decided to stay with Honeymoon Hills. We enjoyed both Gatlinburg and Pigeon Forge. The Comedy Barn was a great show. Our cabin was very cute and clean. All the extra touches such as the gift bag with muffins left on the door made us feel special. 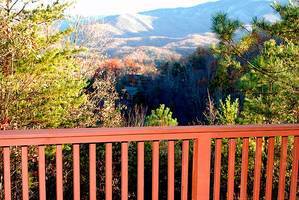 We rented several cabins with Honeymoon Hills in Gatlinburg, TN for my son's wedding at the Chapel at Honeymoon Hills. We really enjoyed these cabins sitting on the little creek. My grandkids enjoyed wading in the little creek so much! Everything was spotlessly clean and ready when all of us arrived at our cabins. We have definitely recommended Honeymoon Hills to our friends! Great cabin! Lots of privacy, doesn't feel like we were in a resort town at this place. Thank you! Our family booked this for my sister's wedding! We had a good time at her wedding, but a great time at the cabin. It was fun to sit around with our family and tell our remember when stories. We mainly stayed in and enjoyed each other until we all had to return to our real lives again! Gatlinburg is very beautiful. It's the perfect romantic getaway and Chapel at Honeymoon Hills was the perfect place for our wedding. Everyone was very helpful and made sure that our wedding and honeymoon was perfect. I would do it again if I could! I would recommend the scenery and the setting for the cabin, it was beautiful. Everything was just perfect and I loved every minute of it. We didn't want to leave! The staff was very kind and helpful. We also had our wedding at the Chapel at Honeymoon Hills. I had concerns at first about having our wedding in Gatlinburg but after my experience with the staff and minister who performed our ceremony, I could not have been more pleased. We really hated when it came time to leave! 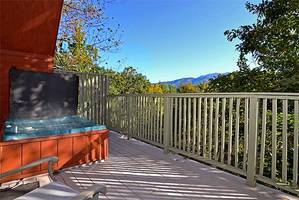 We would highly recommend Honeymoon Hills and the Chapel at Honeymoon Hills to anyone considering coming to Gatlinburg. We stayed at Bear Footin' on the Creek. It was perfect from our cabin to our wedding. The staff was always very helpful and friendly. We drove 13 hours from our home and it was worth the drive. We will definitely be back to Honeymoon Hills! We really enjoyed staying at Bear Footin on the Creek. Everyone was really helpful and answered any questions we had. It will not be the last time we come here. This was the most beautiful place! We will have a wonderful marriage. This was simply a great getaway! It was everything I was told that it was going to be. The cabin was absolutely immaculate and we loved all the amenities about it. Listening to the creek at night was just so relaxing. We will definitely be back and recommending Honeymoon Hills to everybody we know! We booked a trip with Honeymoon Hills to celebrate our honeymoon. 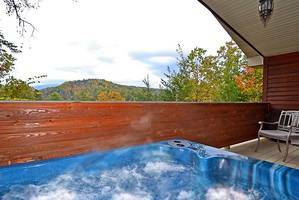 We enjoyed the amazing views of the leaves changing colors in the mountains from our hot tub. Everyone was very welcoming. Honeymoon Hills was secluded and quiet but close enough to town for any activities. Thank you for providing such an amazing honeymoon experience! From the first phone call to make our reservation to taking our last step away fom the cabin, Honeymoon Hills was WONDERFUL! W - Wow, O - Opportunities for all ages, N - Nature views and sounds everywhere, D - Dedicated to making our stay wonderful, E - Elegant cabin & wedding chapel, R - Revealing site seeing, F - Friendly staff, U - Unforgettable memories, L - Loyal to the guests & luxurious life we lived during our stay. My husband and I had our wedding at Chapel at Honeymoon Hills. When we made the reservation the lady was so nice and it was so simple to plan everything. When we arrived to our cabin and opened the door the cabin was beautifully decorated. On our wedding day everything that could possibly go wrong DID! I had to find a dress right before the wedding because mine was ruined thirty minutes prior to the ceremony, my sister had gotten lost with our wedding rings and my husband's family finally showed right as the ceremony ended! The staff at the chapel was amazing! They made us feel like everything was just the way it was supposed to be and as planned. I honestly don't know if we could have made it through the ceremony without them! My family and friends couldn't stop saying how beautiful the chapel and ceremony was. Thank you Honeymoon Hills. We will be back again soon!! This trip was to attend a wedding. We all enjoyed shopping and the dinner shows! 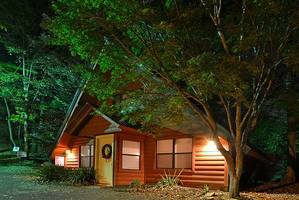 Honeymoon Hills cabins were very easy for me to book with online. All my questions were answered via email (which was my preferred method) in a manner of minutes. My husband and I spend our honeymoon at Bear Footin' on the Creek cabin. Upon our arrival the cabin was super clean. We were greater with rose petals on the floor, balloons, a cake and chocolate covered strawberries. Such a wonderful treat! Honeymoon Hills staff kept everything peaceful, price and perfect for newly married couples. Our favorite attraction in Gatlinburg was the Holler. In Pigeon Forge our favorite was Dixie Stampede. We have tried to visit a variety of food choices, so far Bubba Gumps was our favorite. We plan to come back to visit for sure. Thank you for making our week wonderful! We went to Gatlinburg for our honeymoon. We had a wonderful time! Bear Footin’ on the Creek was so relaxing. I loved the mountain stream. We saw the Comedy Show and Country Tonight. We really enjoyed our stay! We went to Lumberjack Feud Dinner and Show, Comedy Barn, Ripley’s Aquarium, Hatfield & McCoy Dinner Show, Smoky Mountain Opry, Dollywood, went to Cherokee to see the Unto These Hills Drama, ate at The Apple Barn which was incredible—so much food and not expensive. We loved the cabin Bear Footin’ on the Creek. Always incredible to work with Honeymoon Hills and stay with. I absolutely loved the honeymoon package with the petals and balloons. Oh and the cake was awesome! I really can’t thank you guys enough, my anniversary was very memorable! We really enjoyed our stay in the cabin Bear Footin’ on the Creek. It was a beautiful cabin. It felt like home. We will recommend it to our friends! Our stay was wonderful. Our favorite thing to do was Legacy Mountain Ziplines. The cabin ‘Bear Footin’ on the Creek’ was the perfect place to relax after a full day. This place was a cut above the rest! The right amount of peace & quiet with special amenities. 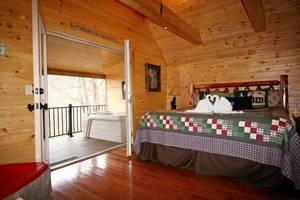 If you are searching for a place to relax away from the rat race of life, look no further than the Bear Footin’ on the Creek cabin. Driving back to our little piece of God’s country made us feel like we were at home. The cabin is tucked away in a quiet little nook. Inside we found everything we needed to unwind. Let the world pass you by while you take a minute to rejuvenate yourself. The hot tub was wonderful. The babbling brook that passes near by reminds you to just relax and breathe. A great place to go and ’stop for a while’. We will be back! The cabin Bear Footin’ on the Creek was amazing! A vacation away from home with all the amenities of home. We would definitely come back and recommend to others. I give this place 5 stars! The couple’s massage for 2 was wonderful. Our week was relaxing and fabulous at Bear Footin’ on the Creek! We were celebrating our 50th wedding anniversary early. We enjoyed the peace, quiet and comfort of the cabin Bear Footin’ on the Creek. 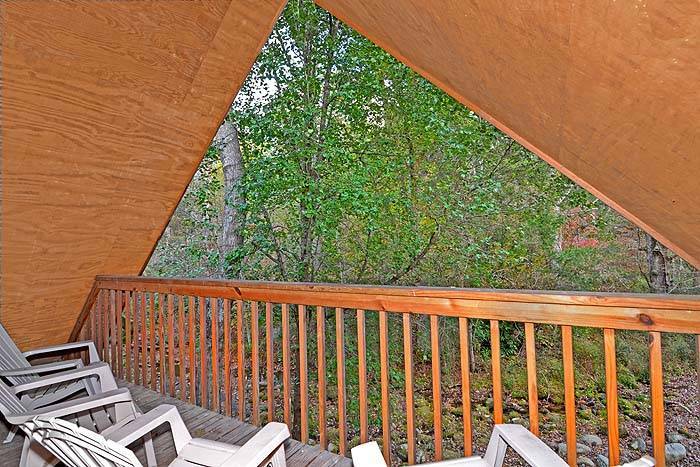 The cabin was everything the internet ad said. I appreciated the cleanliness of everything in the cabin. We enjoyed the Great Smoky Mountains National Park and especially returning to Clingman’s Dome after 35 years. 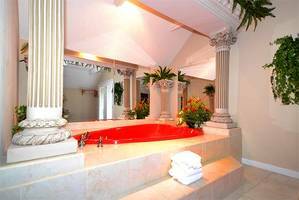 The convenience to all the attractions, the arts and crafts and restaurants but yet away from the tourist crowds. We loved the Crystelle Creek Restaurant on the water and music. The food was great and reasonably priced. Thank you for a lovely vacation. Can you say amazing? Awesome? Well that would describe the cabin. The drive was a little lengthy but well worth it. The colors were changing and it was beautiful. The cabin was the cleanest we have every stayed in. We only stay in cabin when we visit Gatlinburg each year. It was so peaceful and quiet. My husband and I both said we could live there. This will definitely be one cabins we will return. Our favorite restaurant was Locco Burro; our favorite attraction was Deer Farm and Petting Zoo. We enjoyed our stay at Bear Footin’ on the Creek. The cabin was absolutely wonderful. This was a surprise trip. The cabin had all that we needed. The setting was very quiet and serene. It was family friendly as well. We enjoyed Ripley’s Aquarium of the Smokies, putt-putt, go carts and many others! Honeymoon Hills cabin Bear Footin was the perfect getaway spot. After not having a vacation in over two years, my girlfriend and friends found this place online and fell in love with it. The staff was very helpful with all of our questions and keep the cabins up very nicely. 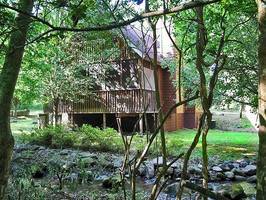 I loved the creek right outside the door with the hot tub facing the creek from the screen porch. It made for a very relaxed and enjoyable break from the real world! The cabin was just far away enough to get out of the city and be alone but close enough you can jump in the car and get to all our favorite sites, restaurants and the attractions. There is no doubt we will be returning guests. This place was a 5 out of 5 stars in all aspects! This was a great place to relax. The set up was outstanding. Thank you guys for the comfortable and peaceful stay. My wife and I will spread the word about how wonderful you all are. We will be returning very soon!